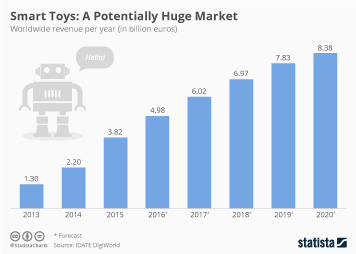 The global toy industry is a billion-dollar industry dominated by five main players: Mattel, Namco Bandai, Lego, Hasbro and Jakks Pacific. Danish company Lego, known for its interlocking plastic bricks, was the industry leader with the highest revenue, 5.49 billion U.S. dollars, amongst the major toy companies in 2016. U.S. toy manufacturer Mattel, closely followed Lego, with about 5.46 billion U.S. dollars in revenue. Tokyo-based Namco Bandai, strong in its domestic market, ranked third in terms of revenue; Hasbro and Jakks Pacific complete the top 5. Three out of the five major players in the global toy industry are American companies. Led by the U.S., North America is one of the most profitable and important regional markets for these companies. In the U.S. alone, total retail sales of the toys and games market was estimated to be over 22 billion U.S. dollars in 2015. The toy industry's annual total economic impact in the U.S. was 80.26 billion U.S. dollars in 2015, while over 287 thousand jobs directly related to the American toy industry were generated that year. The U.S. is by a wide margin the leading importer in the global toy industry. In 2015, the country imported toys, dolls and sports requisites with a value of about 31 billion U.S. dollars, the highest figure since 2011. From this total, China accounted for about 80 percent of all imports of toys, games and sport requisites to the U.S.. China is also the leading exporter in the global toy industry, exporting nearly 43 billion U.S. dollars in 2015. In comparison, the U.S. exported toys with a customs value of about 6.2 billion U.S. dollars that year, of which goods worth approximately 2.1 billion U.S. dollars were exported to Canada, the most important export market for the U.S. Although the number of American consumers who shopped for toys at any toy store has remained fairly consistent over the years, consumers are turning to the internet for purchasing these types of products. The number of consumers who shopped for toys or games on the internet in the U.S. has been constantly rising since 2008, reaching the highest figure to date in 2016. That year, nearly 44 million consumers in the U.S. shopped for toys or games online. Toys retail sales revenue in the U.S.